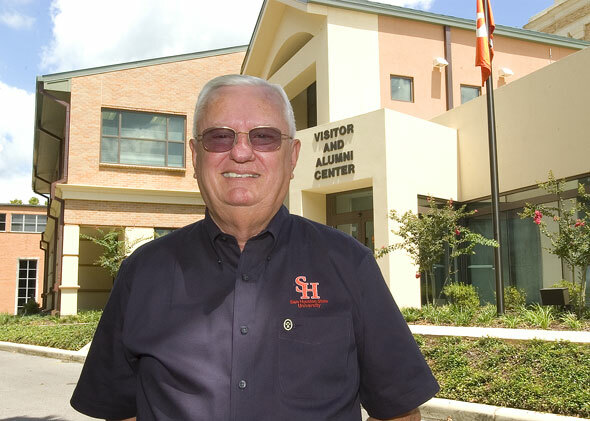 John Ragsdale stands in front of the SHSU Visitor and Alumni Center which will be formally named in his honor during Homecoming festivities on Oct. 20. John R. Ragsdale, a Sam Houston State University alumnus who oversaw the Burger King restaurant franchise in the Houston area for over 30 years, has given $1.25 million to three different programs of the university, which will benefit former, current and prospective students. In recognition of his generous contribution to the university, during Homecoming Weekend on Oct. 20 at 10 a.m., the new gateway building for Sam Houston State will be dedicated as the John R. Ragsdale Visitor and Alumni Center. "Sam Houston State University has given me so much, that I wanted to give back to the university and the students," he said. "Also, I'm hoping that my contribution somehow, at some point in time, will provide an education for someone who may go on to make a significant contribution to society," he said. "They might be a famous chemist, or minister, or entrepreneur. And who knows? Because the endowment will provide scholarships in perpetuity, the money might enable several individuals in the future to make a difference," Ragsdale said. One million dollars will be used to establish the John R. Ragsdale Alumni Enrichment Endowment Fund to benefit the work of the Office of Alumni Relations and for a Joint Alumni Endowed Life Membership in honor of Mr. and Mrs. Ragsdale. The John R. Ragsdale Enrollment Management Enrichment Endowment Fund, to provide financial assistance to the university's Division of Enrollment Management, will be created with an additional $150,000. Also, the Winnie Laurene Ragsdale Scholarship Endowment Fund, in honor of Ragsdale's mother, will be established with $102,500 for the education of a Sam Houston State student from Humble. Ragsdale grew up in Humble. He graduated with a Bachelor of Business Administration degree in general business and a commission in the army in 1959. After serving on active duty in the military, he began a seven-year career with Goodyear Tire and Rubber Company. In 1968, Ragsdale and his business partner opened their first Burger King Restaurant. The business was successful, and at the time of Ragsdale's retirement in 2000, they owned 23 restaurants in and around the Houston area. In addition to being an entrepreneur, he also served on the board of directors of Klein Bank, and was a major stockholder during this time. Jim Gaertner, SHSU president, thanked Ragsdale for his gift to the university. "By tradition, our continuing mission at Sam Houston State University is to provide an opportunity for talented individuals, many of them with limited means, to transform their lives so that they can make a contribution to our world. We are grateful to John for his exceptional generosity which will assist Sam Houston State in continuing in that role," he said.